World Prematurity Day calls attention to the special issues facing infants born prematurely. Today celebrates the development and growth of older babies and children who were born prematurely. It is a great day to support members of your community who work with newborns or premature infants. Or are parents adjusting with a prematurely born infant. World Prematurity Day is a great time to look back on the advances there have been to pre-natal and neonatal care. Celebrate how new research and interventions have dramatically improved the probable outcomes for so many infants who are born prematurely each year. If you are pregnant, World Prematurity Day is a great reminder to discuss pre-term labor with your pre-natal care team. 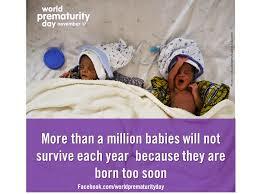 World Prematurity Day is also a good time to reach out to parents you may know who have babies who worn born prematurely. To see how things are going or provide them with encouragement. If you are interested in helping families who are caring for prematurely born infants. Learn more about the special issues that face those babies. Reach out to your local pregnancy center, midwife, or hospital birth center.